An exhilarating trek around the iconic Mont Blanc Circuit through spectacular alpine landscapes littered with dramatic snow-capped peaks. Hike through France, Italy and Switzerland discovering the Alps and the unique architecture and cuisine of each country. The holiday starts in Les Contamines, a traditional French village nestled in the shadow of Mont Blanc. On arrival you can take a wander through the village and see the beautifully preserved Baroque churches. If you arrive early you may wish to go for a walk and warm up for the week ahead. After a short transfer to Notre Dame de la Gorge you start the climb over the Col du Bonhomme and the Col de la Croix du Bonhomme leading to the Chapieux valley. Walk along an ancient Roman path and one of Europe's most famous trails, across blooming meadows and striking woodland to your accommodation tonight, a typical mountain refuge. At the Refuge La Nova, walkers are accommodated in small dormitories for between six to nine people and a hearty evening meal is served in the chalet's cosy dining room. Today's 15 kilometre walk is expected to take around seven hours and you will ascend a total of 1200 metres and descend almost 900 metres. Overnight in dormitory in the mountain lodge/hotel with dinner included. After the first two days spent in France, you will be entering Italy, through some of the most astonishing landscapes of the whole trip. You climb up through a deep gorge surrounded by vast pastures with a moon-like scene as the backdrop. The Col de la Seigne (2516m) and the Aiguille des Glaciers mountains loom large in the distance on the border between Switzerland and Italy. Eventually you reach the top of the pass then descend into the Val Ferret Valley, enjoying magnificent views of the snow-capped peaks. Arrive to La Cantine de la Visaille on foot then take the bus to Courmayeur, a renowned ski resort where you can have a well-deserved rest. Today's 15 kilometre walk is expected to take around seven hours and you will ascend a total of 950 metres and descend almost 1000 metres. This morning you start by taking the bus from Courmayer to Arp Nouva from where the walk starts. Today's walk will take you up a steep ascent and past ruined farmhouses. This marks the start of your journey into Switzerland. You'll walk uphill until the top of the Col du Grand Ferret (2537 metres), where you will enter Switzerland. This side of the mountains often presents glaciers and perennial snow, as it is less exposed to the sun. The descent is through vast open meadows without any traces of human settlement, to the small hamlet of Ferret, where the trail becomes immersed in idyllic scenery of forests, creeks and picturesque bridges, leading you in a short time to the village of La Fouly from where you take the bus to Champex, a beautiful Swiss mountain village situated on a lake. Today's 16.5 kilometre walk is expected to take around seven hours and you will ascend a total of 850 metres and descend almost 1000 metres. This morning you'll begin your trek from Champex as you climb over the Fen\'eatre d'Arpette (2,750 m) to Trient, through cool forests and beautiful alpine meadows across the Col de la Forclaz, an important link between Switzerland and France. This walk enjoys breathtaking panoramas of the Martigny valley and reaches 2,750 metres. 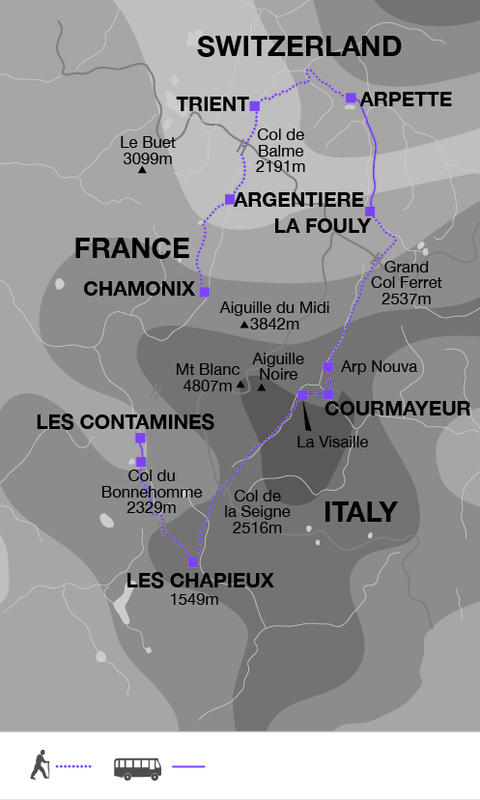 In bad weather a shorter walk over the col de Bovine pass should be taken instead which is around five and a half hours of walking ascending 800 metres and descending 1,135 metres. Overnight in a lodge in Col de la Forclaz. Today's 14 kilometre walk is expected to take around seven to nine hours and you will ascend 1050 metres and descend approximately 1385 metres. Today's walk takes you to Argentiere. You are above the ski resort of Le Tour from where you hike towards Lake Charamillon (2271 metres). You then continue on to the immense Glacier du Tour and back into France. An exhilarating rocky trail along the mountain crest allows you to enjoy astounding views of the glacier and the surrounding valleys. As you reach the border between Switzerland and France, you can see the magnificence of Mont Blanc, a real highlight of the trip, especially on sunny and bright days. You will start to descend among pastures for the last section of the walk until you arrive at your overnight stop in Argentiere. Today's 15.5 kilometre walk is expected to take around seven hours and you will ascend 1000 metres and descend approximately 1050 metres. You begin walking through the pretty little village of Les Frasserands with its typically Alpine wooden houses. You start climbing uphill, into the Aiguilles Rouges Natural Park. You can decide if you want to continue to climb up to Lac Blanc, (it involves a short climb on an iron ladder which is not recommended if you suffer from vertigo), or start descending to La Flegere. The route is very panoramic with the Mont Blanc massif of the Aiguille Verte, the Drus, the Aiguille du Midi, Mont Blanc du Tacul and Mont Blanc laid out in front of you. Descend to Chamonix via Le Praz, if you wish you can take the cable car (not included) down to Chamonix (the last one is at 17:00 hrs). If you are tired or short of time you can also catch the cable car from La Flegere (closed for renovation in 2019). You have completed the Tour du Mont Blanc and can enjoy a celebratory drink in one of the bars in town! Today's 21 kilometre walk is expected to take around six hours and you will ascend 900 metres and descend approximately 1100 metres. The following are essential: good quality waterproof jacket and trousers, fleece jacket, comfortable walking trousers, shorts, warm hat and gloves, sunhat, sunglasses and high factor sun-cream. We recommend walking boots with proper ankle support and good tread. Make sure that your boots are worn-in and comfortable before the start of the trip. We recommend that you wear/carry your walking boots as hand luggage on the international flight. Should your luggage be delayed, your well broken in boots will be irreplaceable. Trainers or trekking sandals are useful for relaxing in the evening. You will need one main piece of baggage (up to 15kg) and a waterproof daypack sufficiently large to take spare layers of clothing, your water bottle, picnic and camera during each days walking (25-40 litres recommended). Please clearly mark your bag with your name and the name of the next accommodation in order to indicate where the bag should go to next. Bags should be ready and at the reception or store room by 09:00 on the morning of your departure. A luggage transfer is included between each accommodation for one item weighing up to 15kg. This is provided by a local taxi supplier. For the night in the dormitory you will need to bring a travel sheet and a towel (blankets and pillows are provided). All bedding is provided on the other nights. Bring a water bottle (preferably 2 litres) and high factor sun cream. Trekking poles are recommended. Tap water is safe to drink as are the fountains found in villages, but water sources along the trail may not always be drinkable. Using tap or purified water rather than bottled water will help avoid creating plastic bottle waste. Energy snacks including chocolate and sweets are recommended whilst on trek. We recommend outbound and inbound flights to/from Geneva airport. Geneva is served by both budget airlines (EasyJet from Gatwick, Luton and Southend) and non-budget airlines (including British Airways and Swiss Air). Overnight accommodation ranges from simple guest houses and family-run hotels to mountain refuges. All are surrounded by the beautiful peaks of the Mont Blanc massif. The simple hotels all offer private bedrooms, some with private bathrooms, others have shared bathroom facilities. In one of the mountain refuges you will stay in a dormitory room with between six to nine beds. For the night in the dormitory you will need to bring a travel sheet and a towel (blankets and pillows are provided). Sheets and towels are included when staying in private rooms. Breakfast and a hearty walkers dinner are provided in your accommodation every day other than in Chamonix and Courmayer where there is there are a multitude of dining out choices. Please note that due to high demand we are unable to offer the option of booking a single room on this trip. For this trip you can fly into and back from Geneva airport in Switzerland. There are several private companies providing minibus transfers from Geneva to Les Contamines via Chamonix and return (http://www.chamonix.net/english/transporthared-transfers ) starting from €20 Euros per person one way for a shared transfer and from €160 Euros per trip for a private one. The journey takes about 1 hour 30 mins. Visas are not required by UK, E.U Nationals, Australian, New Zealand, US and Canadian citizens. Other nationalities should consult their local embassy or consular office. On this journey you walk 97 km over 6 days (an average of 16 km a day). You follow well-marked hiking trails, with the lettering TMB (Tour du Mont Blanc). The route involves some steep ascents and descents of up to 1200 m in a day and some of the days are very long. There are no technically difficult sections nor scrambling required, but the trip is not suitable if you suffer from vertigo as there are sections where you could feel exposed. Sat 15 Jun 2019 - Wed 3 Jul 2019 Your trip can depart anytime between the above dates. Contact us for triple room requests and solo traveller prices. Thu 4 Jul 2019 - Tue 27 Aug 2019 Your trip can depart anytime between the above dates. Contact us for triple room requests and solo traveller prices. Wed 28 Aug 2019 - Sun 15 Sep 2019 Your trip can depart anytime between the above dates. Contact us for triple room requests and solo traveller prices. Mon 15 Jun 2020 - Tue 15 Sep 2020 Your trip can depart anytime between the above dates. Contact us for triple room requests and solo traveller prices.